Shark Week is back attacking television sets for its 28th year, capturing the imagination of viewers around the world. The shark frenzy that happens every year on the Discovery Channel is the cable channel’s highest ratings week of the entire year. Both viewers and advertisers are fascinated by the educational and entertaining shark programs, bringing millions of eyeballs and dollars to the cable channel. Shark Week shows have taught us that these animals aren’t mindless eating machines; they are calculating and use a wide range of senses to stalk and capture just the right type of prey. If you want your business to bite into a larger portion of your market, then using the same skills as these top predators would be wise. 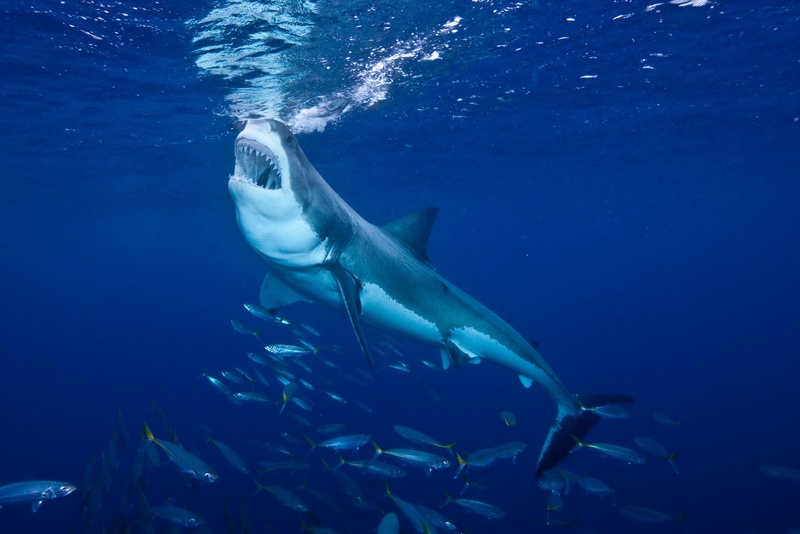 In honor of Shark Week, let’s jump into the water and find out what these amazing animals can teach us about marketing. Here are four shark traits that your business can use to move up the food chain. Sharks have been around for millions of years, in that time they have evolved highly-tuned senses for finding their prey. Excellent sight, smell, hearing, and even detecting the electrical impulses fish give off are all tools used by these specialized hunting machines. While our sense aren’t quite that advanced, we do have some amazing tools that can help us detect market changes and consumer interest. Use tools like Twitter Search and Buyer Persona research to find out what your target audience is saying and to find out details like where they shop, spend their time, and how they like to be communicated to. Study the needs of your target audience because they could change at any time. You’ll need to constantly test and adopt your messages so that you can finely tune it to your audience’s needs. Sharks are curious animals, they like to investigate interesting smells and sounds. This is an instinct that helps them find food in featureless expanses of the ocean. This curiosity unfortunately brings them close to humans sometimes, that’s when curious exploratory bites can happen. Ouch. To be a good marketing professional, curiosity is a great trait to have as well. You need that drive to be constantly trying new things and pushing the limits of what works when attracting your audience and what doesn’t. Keep up-to-date on the latest marketing blogs and see what other brands and industries are doing. You might be able to find something that you can tweak and make your own. The ability to adapt to different food sources, water temperatures, and different hunting methods have made sharks apex predators. Sharks have the unique ability to maintain a warmer body temperature than the surrounding water. This adaptation allows them to react quicker than their prey in colder water. Be adaptable like a shark and your marketing efforts will generate more leads. Adaptation is crucial to success in business and marketing. You need to be aware of your current capabilities and be ready to refine them or change direction when market conditions call for it. For example, A/B testing is a great way to experiment and tweak your marketing messaging. Even if it’s something as simple as a headline, try and test different versions. Even an adaptation as simple as this can lead to improved conversion rates. We all know that sharks can deliver a nasty bite. The fear we have for them is also a big reason why we are so fascinated with them. Those powerful jaws bite down with lightning speed and with precision. Just like sharks, we want to be able to deliver a well-timed message that does exactly what it’s supposed to do. Whether it's a new campaign or a new marketing medium, we want to do it with force and strike when the time is right. For example, let’s say you just started a company blog to promote your brand, don’t focus so much on the quantity of your posts, but rather the quality. Give your audience value and deliver it in a way that connects just to them. A perfectly delivered message will end up generating more quality leads and consequently higher conversion rates. So when targeting an audience specific message, give it everything you have. Make sure it’s the best you can do, deliver it with the power of a shark bite. Watch Shark Week closely this year, see if your marketing efforts can borrow some of the same traits these top hunting machines use to capture their prey. If you do, your company might just be the one with the biggest bite out of the market. For more information on marketing strategies that can take a bite out of the competition, download this free inbound marketing ebook.